This book explains and presents the need for Multihazard Consideration (MH) in the management of civil infrastructure, what constitutes MH, and how to address MH in design and analysis. A generalized theory of MH will serve as the basis of the objective treatment of this volume. Use of MH in bridge management (inspection, maintenance, rehabilitation, and replacement) will serve as the basis for several examples, and numerous case studies will be presented throughout. "This is a very much needed book in the field of infrastructure engineering. This is the first time that the topic of Multihazard considerations has been so thoroughly and clearly studied. This book will serve the engineering community in the years to come as it will be the basis for courses in civil engineering. It adds a new line of thinking to what we already think of as civil engineering." "Multihazard Considerations in Civil Infrastructure is a highly innovative book. It is a timely book given the increasing interest in multi-hazards. 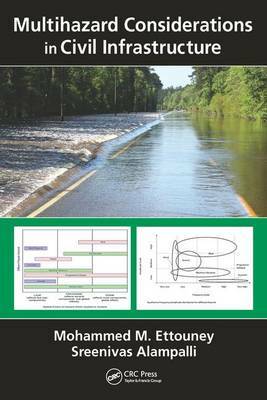 The book provides a strong and quantitative description of multihazard assessment and design. It is an excellent `go to' resource for those readers looking to learn about multihazard analyses for their applications in civil infrastructure. The main strength of the book is the emphasis on multi-hazard analysis in the context of decision making which is where the rubber hits the road in the world of multihazards." "This book will serve as a valuable resource and a handbook for those involved in monitoring and inspection of infrastructures. It is especially useful for engineers considering analysis of infrastructure systems in multihazard environments."